I don't think there is currently a way to blow up all planets and moons to that size. In fact, by default, the sizes of bodies in the game are already exaggerated—just not to that big of an extent. This is a good suggestion though. As for the Earth's axis, there is a way to change that. In fact, there is a way to change any celestial object's axis. Select Earth and open its properties tab. Then, click on the "Motion" tab and scroll down until you see a box/slider that reads "Obliquity." This controls the axial tilt of the planet. A feature to enlarge all objects to that size wouldn't be impossible to implement. You see the "Chart" button on the bottom bar? It sorts celestial objects into a certain order but does not mess with their physics, even though their distances shift. You can explore this yourself. The devs should be able to allow for a function similar to the charts, where the sizes of objects are larger visually, but it does not mess with the physics. As for axis, it does not need to go beyond 180° because 360° is 0°. A planet with an axial tilt of 0° is the exact opposite of a planet with a tilt of 180°. That is, north is south and south is north. Once you go beyond 180° this process starts over again, so there is no need to do so. You can use the Argument Of Obliquity slider just underneath the Obliquity slider to adjust which direction the axis points. 180° is enough to cover everything when used in conjunction with the Argument Of Obliquity tool. Thank you again for your reply. i have experiment lots of option but problem is sunlight stays at the same angel on earth no matter what you do, fyi i have selected realestic and auto under view/light. I'm not sure what you mean by the "same angle," sorry. 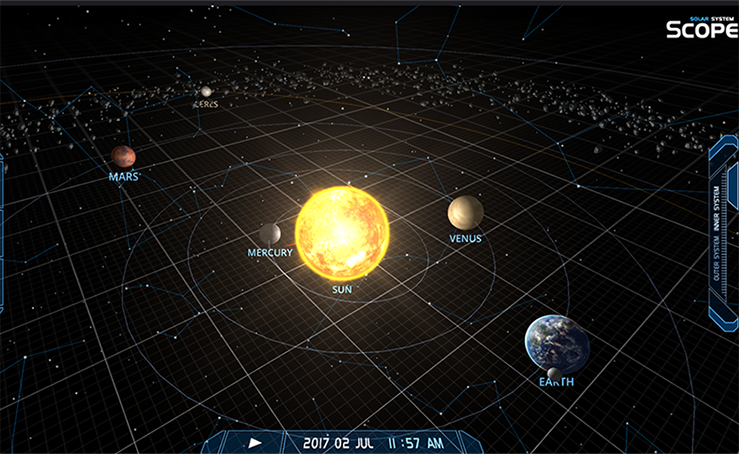 As the Earth moves around its orbit, the northern and southern hemisphere, especially towards the poles, will receive different amounts of sunlight due to the axial tilt. What's the issue you have with this? I'm not sure there is an option to switch off temperature entirely unless you wish to delete the Sun. You can only adjust thermodynamics from a collision or tidal heating. No true way to disable physics either. Under the "Simulation" button in the bottom bar, there is an option to adjust gravity. Set that to zero and no objects will interact via gravitational forces. Be careful though: you also need to zero out the velocity of every object in the solar system if you do this because simply turning off gravity and not zeroing their velocity will cause everything to fly off into the abyss.